Having most of your memory erased via electro shock treatment can't be too much fun. However, in Carrie Fisher's case, she says it was "totally worth it". You have to read her book to understand what memories she lost and why she thinks it was worth it. Once again it's a case of too much. Too much fame (Debbie Reynolds and Eddie Fisher for parents), too much success (she played Princess Leia in Star Wars), too much money, etc. And of course, too many drugs and too much access. Bipolar and depression didn't help. Did one bring on the other? 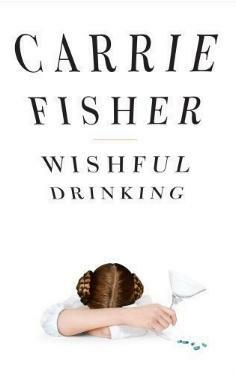 Carrie Fisher's book about her excessive life is told as though she was right there telling you her story. It's full of wit and self-deprecation (often just what's needed), and you'll be smiling as you read her take on life as a depressed drug addict, and as you meet her friends and acquaintences. Her story is not funny per se, it's just that if you can't laugh at yourself, you might as well give up, and give up she didn't. Almost, but she didn't. She tells her story of growing up as Debbie Reynold's daughter, her movie star mom's antics, her father's daliances, all with tongue-in-cheek humor and incredible wit. (I'd love to see her one-woman show.) Not only are we informed of her family's comings and goings, but also of other Hollywooders whose lives weren't necessarily spelled out in the tabloids. In other words, inside scoops without being malicious. Conclusion - A great inside look at the life of not only a star, and a star's daughter, but at fame, drugs, mental health, being bipolar, and, being able to live. Humorously written and eerily comforting.